We provide all brand new equipment, premium private label chemicals and the most extensive checklist system for maintaining your building. We use what works, NOT what is cheapest. We couldn’t find the vacuum we wanted, so we custom built it. 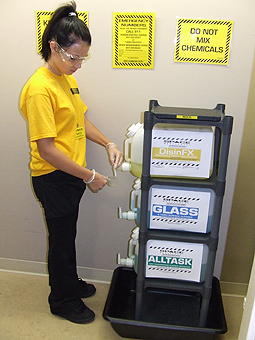 Our color-coded products coordinate with our Level One Training and Certification Program. We don’t skimp on the tools! Space Management will come to work in your building with the people, training, and tools to get the job done right!